Each of you, fathers to this charity ,has the power to make a miracle become reality during this millennium. Information, knowledge and awareness are the three vertices of a triangle that, in our opinion, are the depth and breadth and meaning of every field or issue. This opinion can be applied to all philosophical, historical and technological fields and above all to humans and life. In this respect, the understanding of the health and comfort of the registrant lies in the shadows of knowledge and self reflection that lead to the stability and positive decision making in regards to behavioral problems. We are always responsible for the actions we performed of free will. Recognition of real situations in which humans are placed, and the feeling and understanding of different angles of these situations can be the best measure for avoiding problems.Problems that arise from deception and misunderstanding of the conditions and only have been through uninformed self reflection and emotions are a completely professional game and deception due to cheap professionals. This is the same trap that has sacrificed us many times because of a lack of protection and no longer do we want to be playthings to these deceptions. Problems arise from deception and misunderstanding of the conditions because of uninformed self reflection and emotions. This is a completely professional game and deception is due to cheap professionals. It is the same trap that has captured us many times because of a lack of protection and we no longer want to be playthings to these deceptions. The main goal of the Father Charity Organization is, regardless of the geographical boundaries of the five continents, to think of the real treatment for each patient in need and engage in the mental and physical health of each of these patients. It does not matter whether the patient is next door or hundreds of kilometers away. It does not matter from what race the patient comes. It matters not the rituals they follow or the way in which they interpret the world. The only importance is that they are humans. *Why did we choose the name Father? This is a good question and possesses a better answer. A father‘s investment in his family involves pure love, endless commitment and unwavering support of his family without discrimination, whether he be the richest or poorest man on Earth, or whether he has 12 children or only one. The father is a child’s hero, whether he be as strong as Hercules or barely weighs 50 kilograms. He is truly a hero. The name father always reminds us of a wall to lean on, supportive and encouraging. Even though a mother is known as the goddess of endless kindness and forgiveness, the origin of her kindness is emotional and instinctive. A father‘s love is the kind that supplies knowledge and learning. 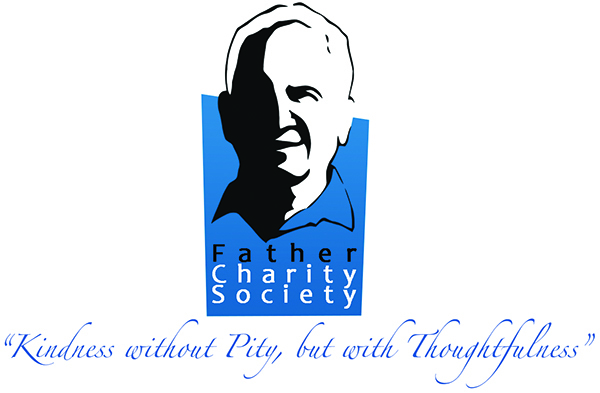 We, at the Father Charity Organization, use this name as a social compass that we reference. To us, the name father is the symbol of wisdom and support and will remain so. *How does the Father Charity Organization understand charitable actions? The understanding of a person in need of help can be identified using certain aspects of our society. One_aspect is the way displays of affection are shown between a mother and her child or equally a father andhis child, in which this show is played out between the two and can be evidently fake or unreal. This may or may not be familiar in your country. *Imagine the crying eyes of a sad child who awaits each car at an intersection and looks at you with his big, hopeless eyes until you either look away or give him something in order to remove yourself from the sadness that is provoked within you by this child. *Imagine a string of unintelligible words joined together with burning pain and fusion. If you have good musical hearing you may be able to identify a few of the words in the unintelligible chatter, but other than that the words make no sense and pretty soon become a drowned buzz. Of course it has been seen that in the midst of these seemingly meaningless sounds another person is revealed. The person extends their hand to others and it is people like him who helps the speaker, but at the moment they do not know what was said and how the speaker has been fooling them. The great American writer Mark Twain _in his book “The Prince and the Pauper” describes a precise understanding of London’s impoverished lifestyle, which is predictable. _Charles Dickens also on numerous occasions within his books mentions the lifestyle of the poor, such as that in “Oliver Twist”. Yes, no matter what, the results of a tragedy are always repeated. We, at Father Charity, don’t ever want these games to be played. In the search for real need and sickness, we, similar to Mulana Jalal-Eddin Roomi, search for the truth in broad daylight in order to prevent anyone from falling for ruses and becoming the cause through which others fall for these dirty tricks. Those in real need of help differ behaviorally from all others who try to immediately and quickly_ cause a guilty feeling in others. These people behave in such a way that one would say that they have no need for attention and only show small signs of sickness and the urgency of their cure makes them uncomfortable. This could be in lieu of the fact that their medicine may be ready for them but they may not have the means to attain such medicine. Many workers in the health industry, particularly those in Asian or African countries, have in their pharmaceutical centers observed that the ill do not take their prescribed medicine prior to the next visit and are often returned to the hospital in critical conditions by their families. When patients are asked: “Have you taken your medicine?,” they reply, “Just look and the silence will suffice”. Their answers are always the same- poverty! These people are of noble character and never ask for the help they need. They are only satisfied with getting help in order to prevent grave damage to their bodies. In other words, their dignity must always be preserved, and this is the desire of the heart of this charity. As the first step, patients are screened by general practitioners where those less fortunate are identified and introduced to the commission which is made up of five main physicians so that their situations andnecessary documents can be reviewed. Next, a comprehensive treatment plan will be created locally with all the essential requirements referred to by the doctor. During this phase, a “support team” calls upon a required number of people that are formed and throughout the course of the patient’s therapy, from beginning to end, will monitor the process monthly via EMAIL. This team is responsible for providing the patient’s necessary medicine. It is worth noting that at the beginning of the creation of each team, record summaries of the patient’s conditions supporting the treatment and the cost of the patient’s recovery is provided to the patient so any and all decisions made are informed and will be considered throughout the course of the treatment. Since your smallest donation means the life and recovery of a patient in need, the first stages of treatment advocated by all financial documents and media accounts of the Government of Canada are approved by the inspectors and financial performance reports will be transparent to the concerned authorities. Obviously, the costs to the Father Charity, including administrative costs, charity services, equipment and location rentals, as well as necessary recruiting, will be based on an organizational chart of charitable foundations that will be by donation and will define the rights and legal procedures that apply. It is also worth noting that the kind helpers who connect with the Father Charity organization begin with lighter cases that take less time and in which the patient is less dependent and less in need of intense care. During the first two years, the “dependently affiliated” takes light cases and once they are comfortable and well trained, after the second year, they begin to take heavier, more advanced cases. These become the “attached affiliations”. Five years later, these people become “health ambassadors” on behalf of the Father Organization and as “Team leader and inspector” will be introduced to various projects that may take place across the five continents. Should a patient or people within his family including his wife, be suffering from a deadly virus such as HIV, which may affect a child upon birth, or in the case of a patient addicted to any harmful substance such as drugs or alcohol, multiple teams will be assigned to monitor and work cohesively so as not to place too much pressure on one team. Some pressures may include having to monitor dosages of medicine or taking care of one’s child, wife or other family member. *Please accept our humble invitation. Father Charity Organization and become a hero to someone in need as you will be changed by each moment. To join this cause please fill out the following form and post it to us. Once your form is received we will pack our bags together and begin our journey toward becoming angels of health.